SYLACAUGA, Ala. – In a 4-0 vote Tuesday night, the Sylacauga City Council authorized the City Attorney, Edwin B. Livingston, Jr., to prepare a required notification letter informing the Sylacauga Little League Association of the Council’s intention to terminate the contract for use of the playing fields in Wingard Park, including McEwen Field, Peters Field, and Roberts Park, effective 365 days after receipt of such notice citing it is necessary in order for the City to better provide for youth baseball and improve the lives of its citizens participating in organized sports within the city. “Everybody thought, for some reason, [Tuesday] night, that we voted, didn’t tell anybody about it and disbanded Little League last night and that was it — no more Little League. That was not the case at all,” said District 1 Councilman Ashton Fowler. “[Tuesday night], we let it be known, that we sent out a letter informing the president and board members of the Little League organization that we were giving them a timeline of one year to the date…if nothing is resolved or negotiated that the contract they have with the city using the fields, leasing the fields, would be void. The letter came from a clause in the contract with the City. If the city wishes to void the contract…our due-diligence is to give them a year warning.” The first-term councilman initiated the conversation with the Little League management months ago. Fowler said the reason behind the letter and motion is because the City of Sylacauga is simply not big enough to support two baseball organizations. Little League has been in Sylacauga for 65 years. Cal Ripken was implemented about 10 years ago. “At first, we wanted to see which one it was going to be,” said Fowler. “In all actuality, it doesn’t have to be either one of those. It could be Dixie Youth. With a city of a little over 12,000, two leagues is just not feasible.” The goal, Fowler says, would be to combine into one or a different organization altogether. “I have had over a dozen meetings with the president of Little League, different district officials, state commissioners with Cal Ripken and Little League,” said Fowler citing there are only six to eight Little League teams in the state, most being in the Mobile or Huntsville areas allowing for less competition and making it harder on families to travel to play in district games and tournaments. Fowler said about two seasons ago, Little League had about 80 players and credited president Rocky Sims for doubling those numbers. “Rocky has been doing an awesome job. He’s doing a great job with Little League. I have nothing but respect for Rocky and the board members,” said Fowler. Fowler said during meetings prior to the City Council, he discussed items at hand with Sims and Jamie Elliot. Due to a sense of “stalemate” after a dozen meetings basically one-on-one, Fowler said it was time to bring the letter to the table. “[We needed] to let [the Sylacauga Little League Association] know we are serious — all the board members, all the council — and negotiate. I don’t need to just be relaying it to [the council]. [The council] need[s] to hear what’s going on and ask their own questions and be informed,” said Fowler. Fowler told SylacaugaNews.com he had been through the organization when he was a kid and that is why he feels so strongly about doing the right thing. “I’m here for the kids. I’ve been through the organization when it was one league and I see how it is with two. There needs to be chemistry built from the time you start playing baseball until you go into more organized middle school and high school ball,” said Fowler. He said it becomes tough to build chemistry at 12 or 13-years-old when athletes do not know how each other plays due to the lack of competition for so many years. 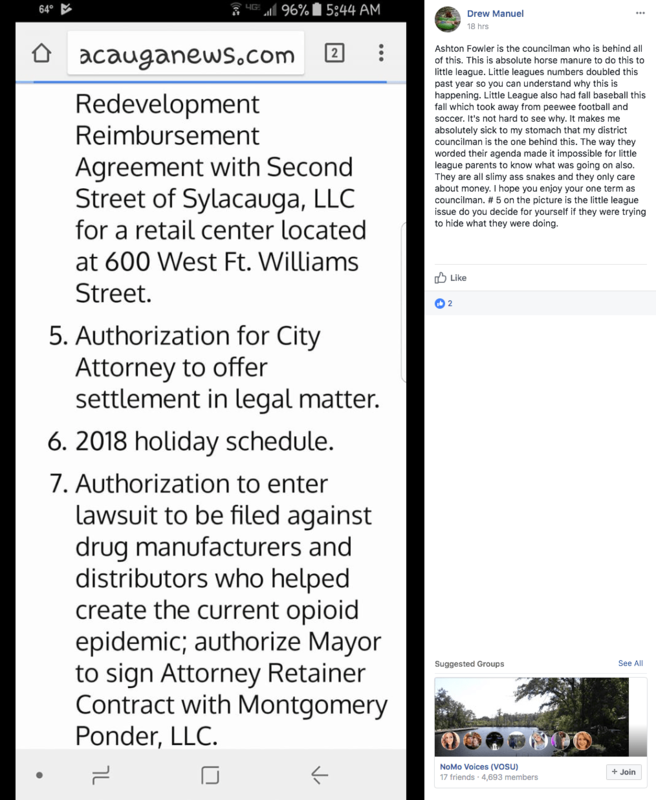 Councilman Fowler said rumor of the Sylacauga City Council ‘disbanding’ Sylacauga Little League started with a post Facebook about an action item completely irrelevant to the discussion. “[It was said] this agenda item was where we ‘hid’ and try to ‘cover up’ what we were doing as ‘disbanding’ Little League. The item screenshotted was a city matter dealing with other things completely irrelevant to sports. They thought that was quote “gibberish” that we put in there to ‘disband’ Little League. That was not the case at all,” said Fowler. SylacaugaNews.com reached out to Sims Wednesday. He said he was disappointed and was blindsided by the decision from the City Council, particularly from Fowler due to multiple discussions held. Sims said there was talk about consolidating both Cal Ripken and Little League into one but an agreement was obviously never reached. The president said the association would not go down without a fight. The Sylacauga Little League Association posted to its Facebook page early Wednesday morning expressing its views and disappointment in the council. The City of Sylacauga owns the fields on which Sylacauga Little League Association currently plays. Fowler said when the City consolidates into one organization, the baseball association will have access to both Wingard Park and the B.B. Comer Complex. The Sylacauga Little League Association renewed its 10-year contract with the City of Sylacauga in 2014 expanding its time to 2024 to lease the fields and play. Click here to view the City of Sylacauga – Sylacauga Little Leage Association contract. The Sylacauga Little League Association will play in 2018.